Cassini Spacecraft Ends Its 20 Year Mission With A Graceful Crash Into Saturn | Creativewi.re! - Science wired into your brain, creatively! NASA confirmed the disintegration of one of the most successful space missions in history at 7:55 a.m. ET. The spacecraft actually started performing its final death dance at 6:30 a.m. ET Friday, but given the fact that the signal needs about an hour and a half to reach Earth, the confirmation of its demise was delayed as scientists had to take into account this time difference. Cassini was a very tough craft as it continued to transmit new data about the planet atmosphere for about a minute after its final dive. Then, it disintegrated and was crashed into pieces by the high pressure of Saturn's atmosphere. This infrared image was one of the last set of data transmitted before the spacecraft's disintegration. 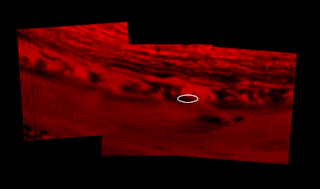 It highlights the location at which Cassini performed its farewell Harakiri. When this picture was taken, the spot of Cassini atmospheric's entry was on the night side of the planet. However, this location would switch back to daylight by the time Cassini crashed into Saturn. The Cassini-Huygens mission is a joint project of NASA, the European Space Agency and the Italian Space Agency. It was the first space probe to orbit Saturn. The spacecraft was launched in 1997, and it took it 5 years to reach Saturn and started orbiting it in 2004. Cassini marked history as the first space mission to perform a landing of a spacecraft in the outer solar system through its probe module Huygens which was separated from its mother ship and landed on Titan on January 14, 2005. Cassini was also an important step humanity took in the search for alien life. Its data confirmed the existence of liquid hydrocarbon lakes in the polar regions of Titan. Its discoveries challenged our understanding of where to look for extraterrestrial life in the universe and have certainly paved the way for more research on the subject. Cassini truly carried its mission to the fullest and has undeniably carved its names in the history of space exploration with golden letters.